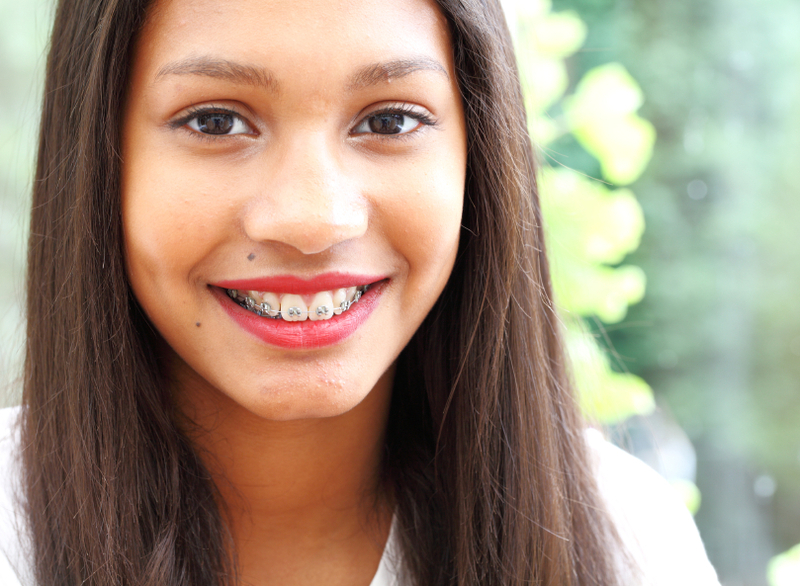 Many children and young adults wear orthodontic braces to correct facial irregularities, and the results are amazing. However, some patients discover stained teeth after braces are removed. After all the time, effort, and expense put into braces, these stains, caused by plaque that accumulated on the teeth around the brace attachment points, can seem doubly frustrating. The stains are usually white and there’s often a slight indentation and roughness to the tooth. Although over time these spots fade slightly, the only way to remove them completely is through specialist treatment. Bacteria naturally accumulate on your teeth, especially around braces and, if not removed, form plaque. The bacteria excrete an acid that leaches minerals out of the tooth, leaving a hollow part that is usually whiter than the surrounding area. What’s happened is that decalcification has taken place under the plaque. To an extent, this process is irreversible and can only be prevented by regular and careful brushing of teeth around the brace attachment points to remove bacteria before plaque is formed. Provided proper dental hygiene is practiced, the spots will not get bigger. However, without treatment, stained teeth after braces won’t disappear, although they will gradually fade. A dental veneer is an extremely thin covering that is glued to the tooth. It’s made from porcelain or a composite resin and colored to suit the teeth. Before application, the tooth surface is treated to provide a strong base and the veneer fastened to the discolored tooth using special dental cement. The veneer is permanent and is designed to match the other teeth. It’s possible to replace the minerals that have been leached out of the teeth using a specially formulated mineral paste. The paste is applied on a daily basis over a period of time and this allows the teeth to reabsorb calcium and phosphate from the paste to replace minerals that were lost. Various products are available, some over the counter, but it’s best to consult your dentist to find the best product. As the minerals are absorbed, the spots fade and, in some instances, completely disappear. The white spots may cause a slight depression in teeth, and sometimes a small dental cavity is formed. Your dentist can repair the cavity with a special resin that is colored to match surrounding teeth. If the damage caused by the spot is so severe that the outside enamel is damaged, it’s essential to have the cavity filled before bacteria cause further tooth decay. Another technique that is used is polishing the affected teeth with a fine polish made up of pumice or silicon carbide and hydrochloric acid. This procedure is performed by your dentist, who will lightly polish each affected tooth for a few minutes. The polishing removes a tiny portion of the outer enamel layer, exposing new enamel. This enamel is lighter in color and consequently, spots will be much less noticeable or disappear completely. While the best cure for stain removal is prevention through careful brushing, this doesn’t always work, and stains are discovered when the orthodontic braces are removed. Fortunately, several different treatments can be used to remove or hide these unsightly stains. If you or your child has stained teeth after braces, speak to a professional, who will select the most appropriate treatment to restore your smile. Often a combination of the above treatments gives the best results. Browse through our website today to learn how you can get the smile you’ve always dreamed of!